The Lover's Path Tarot comes to us from the creator of the Goddess Tarot, Kris Waldherr, and while the highly acclaimed Goddess Tarot is a tribute to the talented painter and storyteller, Waldherr outdid her own formidable reputation with this latest. She had to be immersed in the creative artists' "zone" every minute of the 10 years it took to create The Lover's Path Tarot. My head can't stop saying, "how wonderful!" and my heart echoes, "how beautiful!" when I look at these cards. I can't help myself -- I am in book-lover's ecstasy, too, over the find of a new "Precious" for my substantial hoard. As is usual with myth-based theme decks, you need the companion volume to fully appreciate and interpret the deck along the lines the author intended, but you could read the Lover's Path Tarot without it. The familiar Rider-Waite-Smith model underlies all, although the cards have been given rather more romantic and fanciful titles. For example, The Fool is Innocence; The Devil is Temptation; The Star is Grace; and The World is Triumph. The book is sumptuous, though, glossy and colorful, and you'll be glad you had to purchase a set. Its wine or burgundy cover matches the reversible card backs. A lover's-throat-cream shade highlights portions of the book's interior and glances off the card faces, shedding light on many a tryst. A moody grey sky is painted into the frontispiece and inside back cover, reminding us that into every couple's life, a little rain shall fall... stars arc overhead and the clouds are pierced with lightning bolts. The Little White Booklet has the usual limitations of scale, but you don't need it. The cards are matte, the same size as the Goddess Tarot, making them a little wider than average (3 1/2 inches wide by 4 3/4 inches tall, including borders). Burgundy, gold, green, and blue predominate. Strength is VIII; Justice XI. 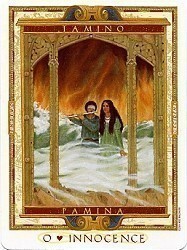 Each Major Arcana card depicts a couple from an historic myth or legend, some dreamy and sensual, some tragic. Can you imagine any couple other than the iconic Romeo and Juliet to illustrate Tradition (The Hierophant)? Or other than Isis and Osiris as Love (The Lovers)? Some myths work better than others in carrying the energies of the Majors, but that is always a matter for personal interpretation; no two readers will agree on card-myth assignations. One or two combinations strike me as moderately discordant. I'm not sure that the Roman lovers, Vulcan and Venus, belong on Balance, Waldherr's Temperance card, to which she has attributed the keywords equilibrium and harmony--unless the author was thinking of the volatile Vulcan balancing his affections between Venus and his other wife, Maia. Venus, we know, was not at all reticent when it came to extramarital affairs, so maybe the couple's relationship did balance out in the end. When you scratch beneath the surface of the ancient legends, multiple personalities abound, making it hard ever to find a myth that squares with readers' preconceptions about the cards. The suits -- Cups (water and emotions), Staves (fire and action), Arrows (air and intellect), and Coins (earth and manifestation) -- carry the familiar attributes of Cups Wands, Swords, and Pentacles respectively. The older tarot names of Staves for Wands and Coins for Pentacles emphasize the nostalgic overtones in this deck. Arrows "prick our consciousness into awakening," Waldherr tells us, but they don't leave us mired in gloom or despair. Each suit enhances one myth that is assigned to the Major Arcana. 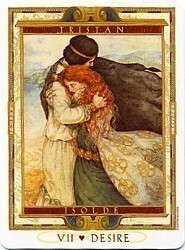 Tristan and Isolde in the suit of Cups appear also in VII Desire (The Chariot); Siegfried and Brunnhild in the suit of Staves are associated with VIII Strength; in the suit of Arrows, Cupid and Psyche are associated with XIX Awakening (The Sun); and Danae and Zeus of the suit of Coins also are found on X Fortune (Wheel of Fortune). 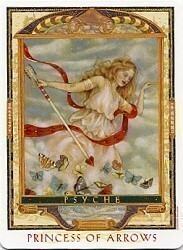 I postponed purchasing this tarot a while, although it called to me for answering love queries. I trusted Waldherr's integrity as an artist, but wondered if the publisher had succumbed to infusing the set with valentine sentimentality or dumbed-down lovers' advice captions. I am pleased to report that U.S. Games took the high road. It's a wonderful tarot to decipher emotions surrounding any relationship question. You could fall in love with the deck so much you won't want to limit it to romance readings. Usually there are minor flaws in even the highest quality books and decks, but there's not much to criticize here. The high quality of the book warrants the longer life a hard cover would have gained for it, but that decision may not have withstood the publisher's cost/benefit analysis. The grammarian in me wonders whether The Lover's Path should have been written The Lovers' Path (it takes two, right? ), or whether that was a conscious choice of author or publisher. 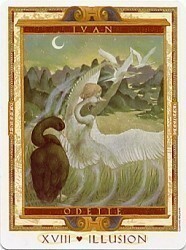 In this tarot, a case could be made for using either singular or plural. While my Libran sensibilities are awash in the aesthetic wonder of the deck, my heathen sensibilities would have preferred a more positive name for The Moon than Illusion. I won't obsess about it, though; the darker threads of love and relationships had to be woven into the Majors, but the tradition since Eden Grey, at least, has been for tarot writers to emphasize negative and fearful aspects of The Queen of the Night that don't sit well with me. The back of the book contains a well-planned and executed card reference guide imposed on grey pages with burgundy borders. Charts (Major Arcana followed by the Minor suits), reference Waldherr's card names along with traditional names, keywords, and a mythological pair of lovers for the Majors, and card names and keywords for the Minors. Numerically consecutive, colored thumbnail images of the cards at the left of the charts serve as a memory aid. The layout is ideal for locating the card you're looking for -- the entries are well spaced out and two colors alternate for successive cards within the charts. For example, the list of Cups cards is distinguished by an alternating blue and light grey backdrop. The last section is a list of resources Waldherr consulted, where books, films, musical works, and Web sites are segregated from each other. As much care and attention went into designing the back matter of the book as the cards. The set is sold in a substantial burgundy box with a Velcro closure. It also contains a cream-and-gold scroll, on which is duplicated, in burgundy, the card layouts from the book. 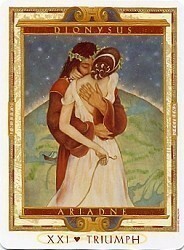 You'll see the ubiquitous Celtic Cross and six more tarot spreads appropriate to the lovers' theme. The scroll is printed on both sides; I had mine laminated so it would lie flat. The book mentions an official Web site for The Lover's Path Tarot, as well as Waldherr's personal Web site, where you can find out more before you buy. A limited edition of this deck and book set is available online, which includes an extra card and a numbered print. Waldherr's Internet site reveals she and her team are not without marketing acumen -- you'll discover quality in her online presence, too, that exceeds the ordinary. If romantic themes, mythology and beauty intrigue you, The Lover's Path will be winding its way into your tarot collection very soon. See details Lover's Path Tarot by Kris Waldherr(creator of the Goddess Tarot).